Just like trimming your cat's nails/claws on a weekly basis, you should also inspect, and if needed, clean your cat's ears at the same time. If you do this on a routine basis, you will ensure that your cat is not developing any type of ear problem (discharge, ear mites, etc.). Ear cleansing solution. There are two ear cleansing solutions that we use and recommend. PinkPawPal Ear Cleansing Solution (a natural product). The Ear Cleansing Solution by PinkPawPal gently cleans ears and prevents mites. Inspecting your cat's ears as part of regular grooming will help prevent ear infections that might otherwise go unnoticed and untreated. To clean your cat's ear, grip the top of the ear and gently turn the ear flap inside out until you can clearly see the interior. If the ear appears clean there is no need for you to clean it. If the ears show signs of any discharge (other than brown ear-wax or dirt) such as green or yellow pus, red or dark red/black (which smells pretty bad), or any other discharge out of the ordinary, take your cat to the veterinarian as these types of discharge indicate a bacterial or fungal infection or a mite infestation. Put the ear cleaner directly into each of the cat's ears. Rub the base of the ear for about 30 seconds to work-in the cleaner. At this point, you can trim your cat's nails which will give the cat time to allow it to shake its head to dislodge any buildup in the canal. If the cat does not need its nails trimmed, then wait a few minutes to allow the product to loosen any ear wax or debris. 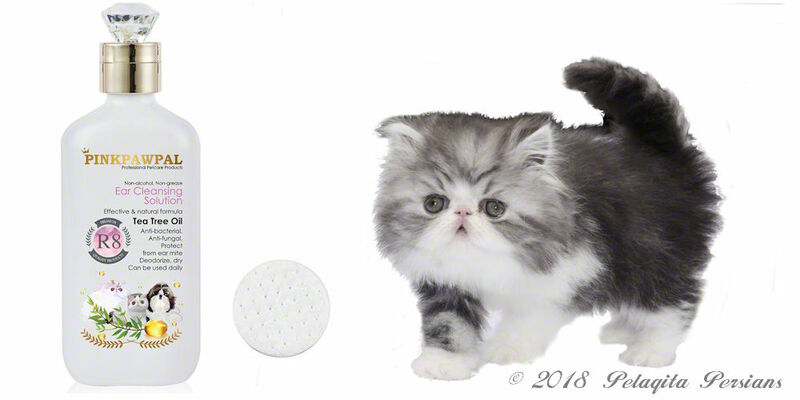 Moisten a cotton ball/cotton make-up pad with the ear cleaner and gently wipe the cat's ears. Do not go too deep into the ear canal as this could impact (rather than remove) the buildup you are attempting to eliminate. Never use a Q-Tip, unless instructed to do so by your vet. As with humans, that old adage that doctors are always telling us "do not put anything smaller than your pinky finger into the ears" applies to our cats also. After cleaning your cat's ears, praise and pet the cat and offer it treats. Offering your cat affection and a favorite treat at the end of ear cleaning or nail trimming will help to ensure that in the future, the cat will not associate grooming as a distasteful experience. Grooming is easier and less traumatic for all involved if your cat is looking for attention or feeling sleepy. A cat who is in an energetic or playful mood is more likely to struggle and scratch during grooming. If your cat will not cooperate for the cleaning, get a second person to help hold the cat, using minimal restraint, remembering the more restraint used will cause the cat to become less cooperative and it may be more inclined to claw and try to escape. Additionally, it will be more difficult to clean your cat's ears the next time if this experience is traumatic to your cat. If you have any doubt about cleaning your cat's ears, the type of discharge that you find, or the experience is too traumatic for the cat, consult your vet. Warning - Do not clean too deeply in the cat's ear canal as this could result in damage to the tissue that lines the ear canal or even rupture the ear drum.